"In the long term, we think of Chromium as a tabbed window manager or shell for the web rather than a browser application. We avoid putting things into our UI in the same way you would hope that Apple and Microsoft would avoid putting things into the standard window frames of applications on their operating systems. The tab is our equivalent of a desktop application's title bar; the frame containing the tabs is a convenient mechanism for managing groups of those applications. In future, there may be other tab types that do not host the normal browser toolbar," explains a document about Chrome's user experience. This philosophical shift might explain why there are few interface distractions and the browser is barely visible. Google Chrome is built for web applications that have their own menus, keyword shortcuts and status bars. Chrome comes with intelligent defaults to minimize the interaction with the browser. The settings dialog doesn't include many options available in other browsers and the team hopes to "reduce the number of options further". The lack of customization is not a good news for advanced users, but normal users might appreciate the simplicity of the interface. "The heck with more features, is Safari 3 faster, more stable, less memory-hungry and more compatible on the web at large? That's what I want to see in each release," commented Peter Kasting on an article from 2006 about Safari 3. Peter Kasting is now an engineer in the Google Chrome team. In a way that is good though you know. I mean IE 7 has "features" that are so well hidden that they might as well be not there at all. As long as they give us a plugins API that can change the interface and functionality massively, then i am happy. Um, sorry, I still need a browser. I'm cautiously optimistic. I can't test Chrome because I run Linux and OS X which puts me, apparently, off the radar screen for Google. I checked the developers area for Chrome (to try and get REAL scoop on when I might expect a version I can use) and it appears they used Microsoft development tools to build Chrome. I'm still waiting for an explanation for this that makes sense. MS development tools are first and foremost designed to make porting to other operating systems difficult (if not impossible) DUH! This only makes sense if the current version is really a design prototype that will eventually be thrown away for the REAL Chrome. I've watched MS developers get half-way through a project only to find they can't make the GUI developer tool do what they want, but they don't understand the generated code enough to do it there, and if they did, the GUI tool would stop working. It's a nightmare, tar-baby, death-march to completion methodology which explains why so many third-party Windows-based application look half finished (because they are). If when I comment here I gues wrong on the captcha code, I get the old familiar dialog that allows me to get e-mail follow-ups (I have to have made a copy of my post however as it disappears to never never land. If I guess the captcha code correctly, my comment goes through right away, but I get no chance to toggle follow-ups. Is this the way it is supposed to work? PS: I'll guess wrong this time to toggle the switch for this post. I was just using a Google spreadsheet (Google Docs) and was lamenting the real estate taken up by Firefox as I run it (about 2 vertical inches of toolbars). 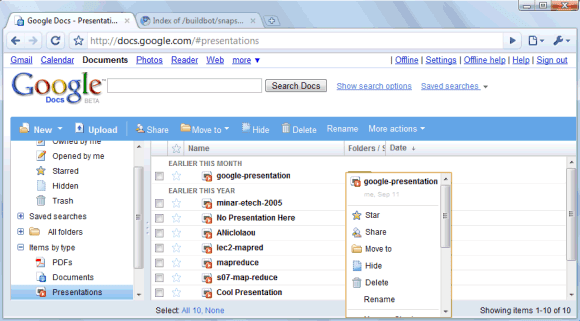 Using less real estate will be a benefit to using Google Docs - though just using full screen mode does the trick. I am very enamoured of the many options and ways of configuring Firefox. It is going to be painful to trade too much of that away, although perhaps it tends toward chaos unchecked. ALL The More Reason For "Full Screen/Auto-Hide"!!! I like it because it is simple and like its features.